How to Correct your AoE. AoE stands for Angle of Engagement. That is a fancy way of saying how the sector gear hits the piston. Ideally, you want it to be as even as possible between the sector gear and the piston itself. No gun comes with correct AoE, and by correcting it, you can make your stock piston last much longer than it normally would. 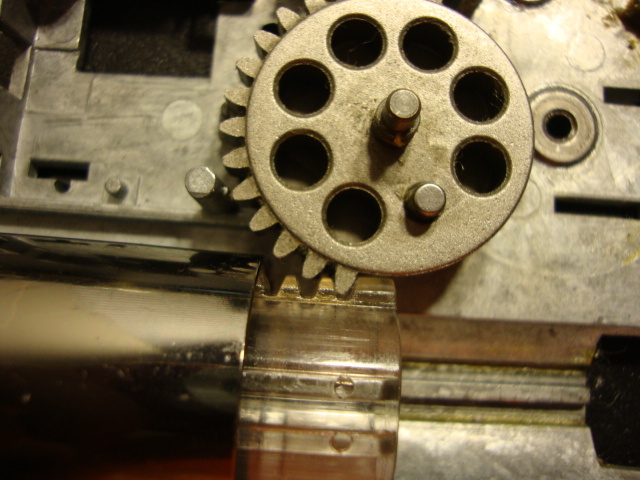 The idea is to make the sector gear's first tooth make as much contact as possible with the piston's first tooth. This spreads the force out, allowing the piston to carry much more weight, and last much longer than it would normally last. Why Should You Correct Your AoE? 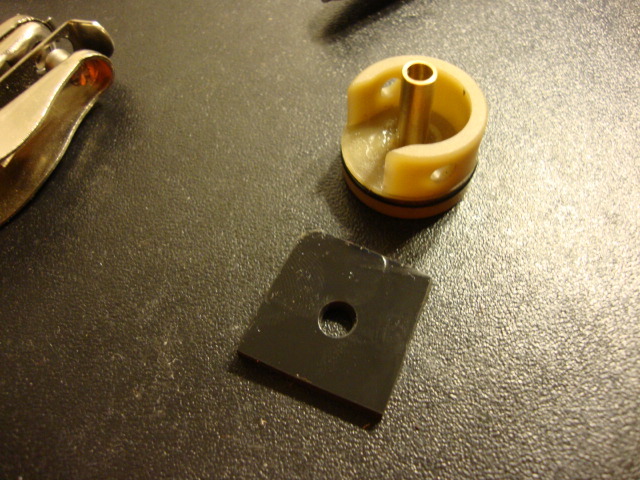 Improper AoE often leads to a snapped pickup tooth on your piston, or a warn down piston tooth. It can also result in wear on the second tooth of the piston, if the AoE is already a little correct, this isn't as major as the damage to the pick up tooth, but it's something to note, none the less. 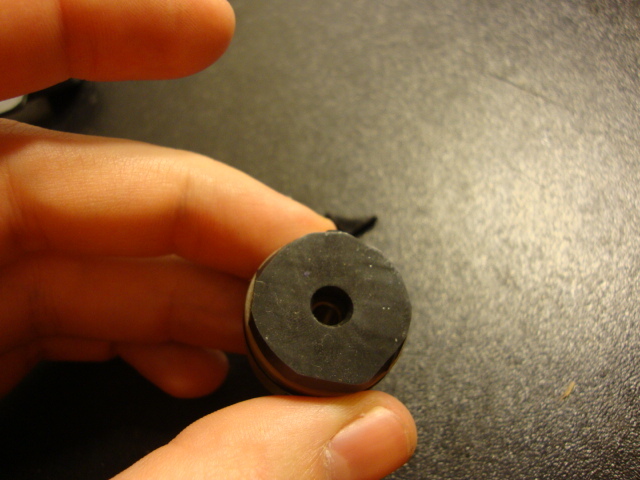 Like I've said, the idea is to make the first tooth of the sector gear match the first tooth of the piston perfectly. 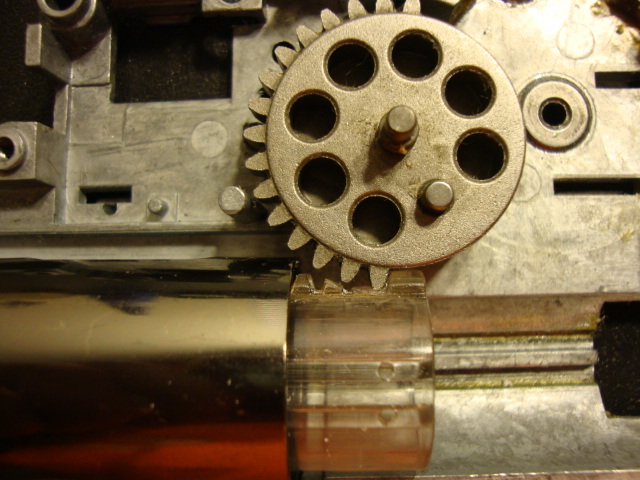 See how the gear is engaging the piston. It's off, at an angle. This is bad, and this is what caused the piston failure you saw in the first picture. What we want to do is put spacers on the piston, or on the cylinder head, so that it pushes the piston back further, and the sector gear engages it properly. Now, the best way to correct your AoE is by using Sorbothane padding. It is a shock absorbing foam that will keep your piston pushed back, while also absorbing the shock from the spring. This not only keeps your piston lasting longer, but it also keeps the gearbox shell in one piece. Because it absorbs shock, it greatly decreases the likelihood that your gearbox will crack. Because it helps in both of these areas, I use Sorbothane in all AoE corrections. Now, I first want to say that the best way to do this, would be to order a sorbo pad from Sorbopads.com. That website is run by a stand up guy, who offers quality parts and makes it really simple for people who don't have dozens of guns to install sorbo on. If you do order some sorbo pads this way, you can skip the cutting process and jump straight to how to glue the sorbo pad onto the cylinder head. I currently use McMaster Car, and this is how the sheets of sorbo arrive. They still need to be cut to shape. If you have the right tools, it's not difficult. Here, you can see the exact stats of the sorbo that I pick up from McMasters, I'll go over that process in more detail later on. Anyway, what you need to do is take your cylinder head, and press it into the sorbo padding. Make sure you press hard and keep it there for a few moments. 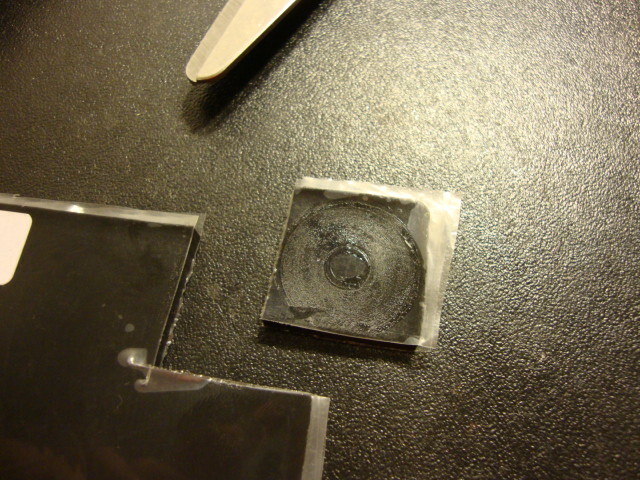 What we're trying to do is put an imprint onto the foam, so that we have a shape we can cut out. A shape like this. Now, the easiest thing to do is to cut out the square around the circle. 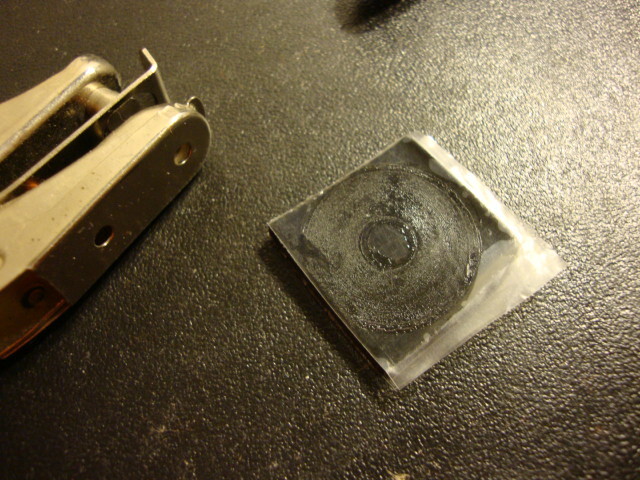 Now, next, you're going to want to use some hole punchers to put a hole in the middle of the sorbo pad. 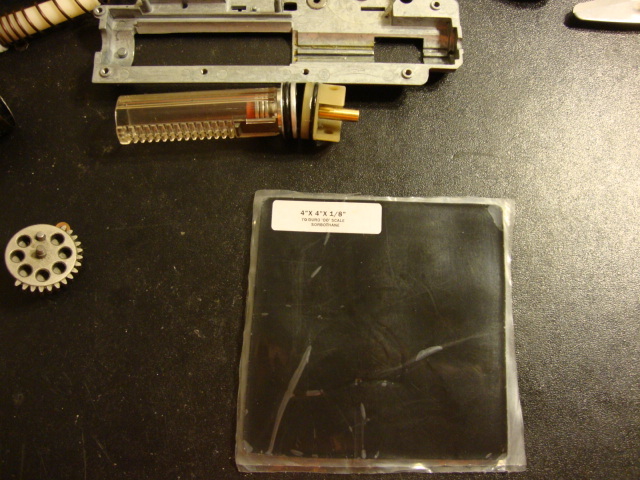 Notice, the plastic covering is still on the pad, that will make this process much easier when trying to wiggle the pad into the appropriate position for a hole punch. You can see here, where the air port was on the cylinder head when you pushed it into the sorbo pad. You want your hole to be right where that area is, you want the hole to be right over the cylinder head hole. It's vital, as your gun won't work right, if it can't get air out of the cylinder. 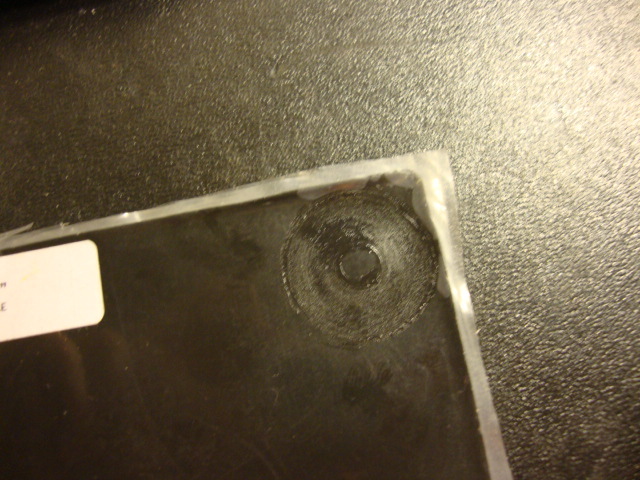 There, the hole is right in the center. 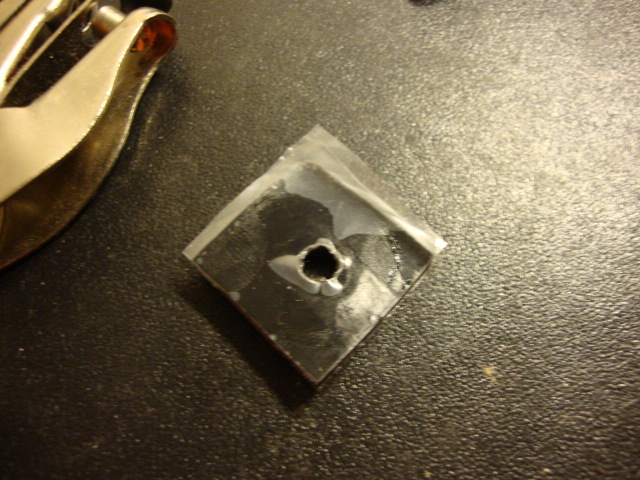 Now, for other guns, the hole won't be right in the middle, it just so happens to be that way for this cylinder head. Alright, now you'll want to glue the sorbo pad onto the back of the cylinder head. Make sure the cylinder head is clean, you don't want grease on it when you try to put the glue on so that the pad sticks. 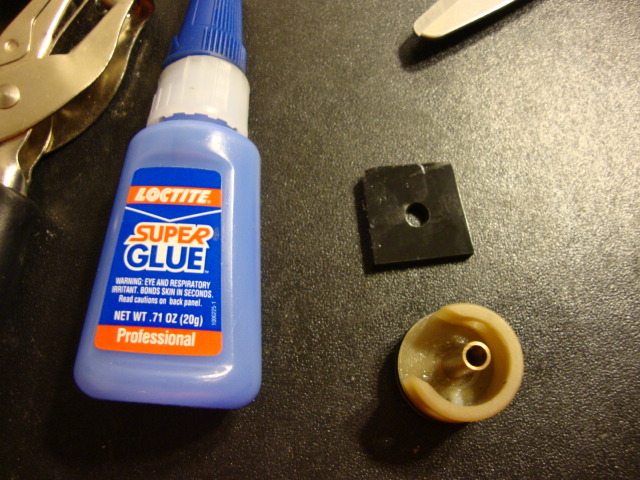 This is the glue I use to glue a sorbo pad onto a cylinder head. This can be picked up at any Walmart, Lowes', and stores of the like. Simple super glue will work as well. You'll want to distribute the glue evenly around the cylinder head. As seen here, on this picture. Having it centered on the cylinder head isn't all THAT important, the glue will spread out when you press the pad onto the cylinder head. It's more important that you actually just have an even amount. Now, you'll want to center the sorbo pad onto the cylinder head. You'll want to do it before you actually press it onto the cylinder head. Try placing it slowly onto the cylinder head as you look down the hole. You want to be sure that the hole in the sorbo pad lines up with the hole in the cylinder head more than making sure the pad itself is even on the cylinder head. Here's what it should look like once it's been pressed onto the cylinder head. 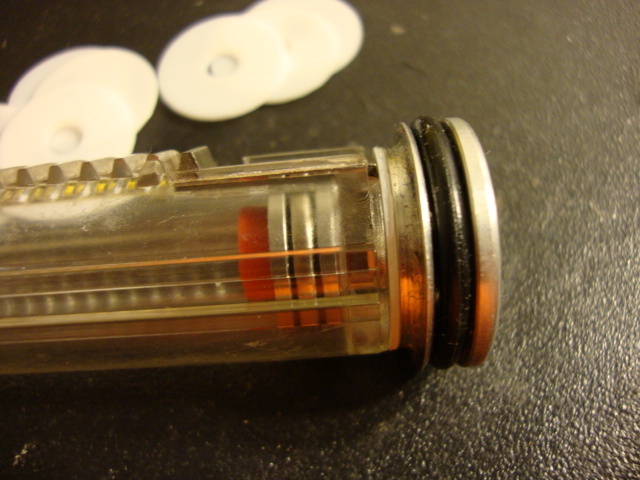 You can see that the hole punch makes a perfect little hole, just right for the cylinder head. Next, you'll want to cut off the extra sorbo off of the cylinder head. Make sure that the glue has set, it shouldn't take more than a few moments, but if you use too much, it will take more time to dry. 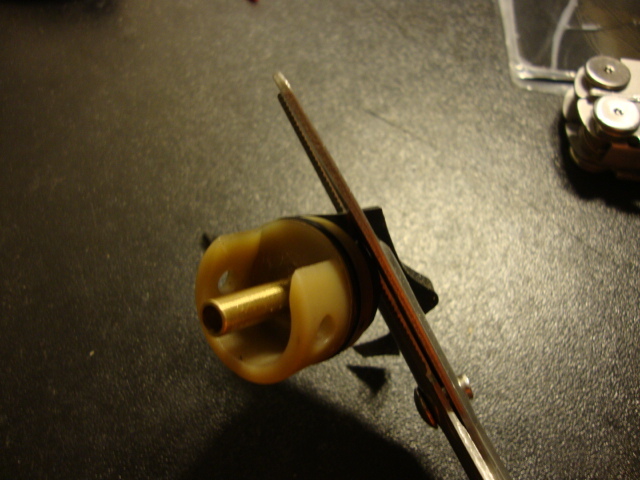 Once it has finished drying, just use some scissors to cut off the extra sorbo from around the cylinder head. Now that that's done, you can stick the cylinder head back in your cylinder, and place it back in your gearbox. 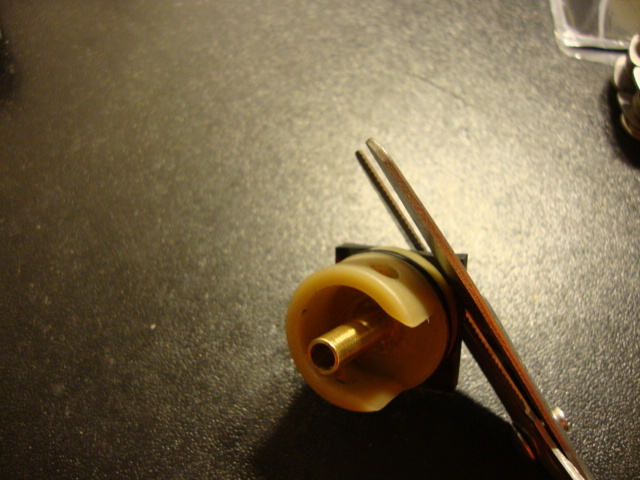 Then, put your piston back in and check it's AoE with the sector gear. Ah, it's not quite there. As you can see, the sector gear and the piston aren't quite making that flat contact that we want. We'll have to do a little something extra. There are a few things you can do here, either get some rubber pads to glue on top of the sorbo, or, get some washers to place behind the piston head. I use the washer method if the sorbo isn't quite enough. Here, you can see the washers in the back ground, and you can see that I've got one placed behind the piston head. This will scoot the piston forward just a fraction, and possibly fix the AoE the rest of the way. Let's stick it back into the cylinder and find out. There we go, a perfect match. Now, some of you more logical people out there will notice that if we leave the piston like this, when the sector gear turns, it will grab the second or third piston tooth instead of the larger first tooth. 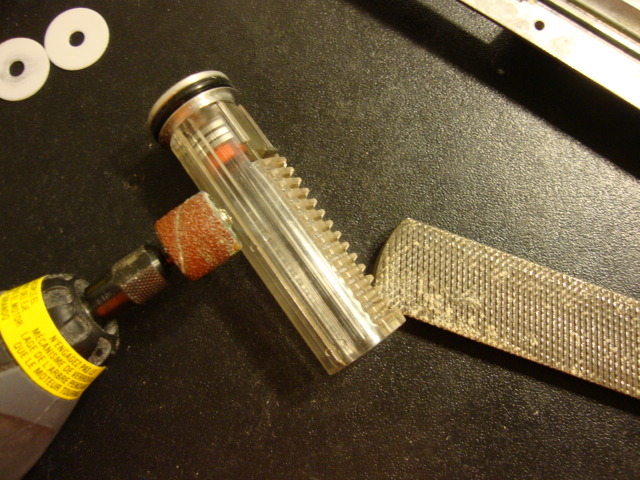 We'll have to remove those enough so that the sector gear engages the first tooth first and not any of those others. 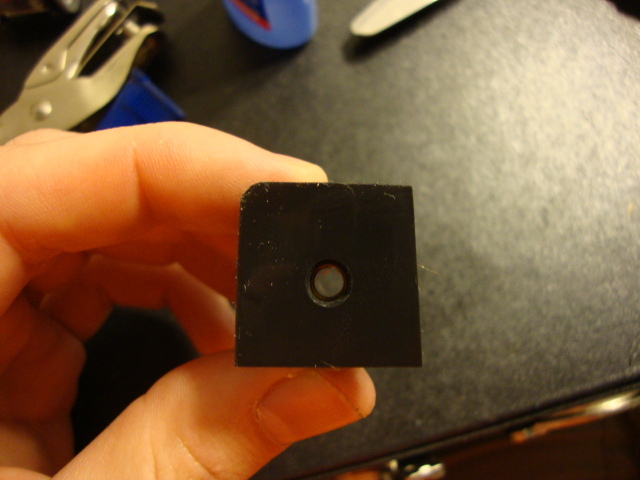 You can use a file or a dremel to get the job done. Just make sure you remove the complete second tooth, but you want to leave as much of the third tooth as possible. You don't want to have to completely remove the third tooth of the piston. It makes it extra hard on the pick up tooth of the piston, and increases it's likelihood of breaking. There, notice how the third tooth is still partially there, but just enough of it is missing so that the teeth don't hit it as they spin. That's how it should be. 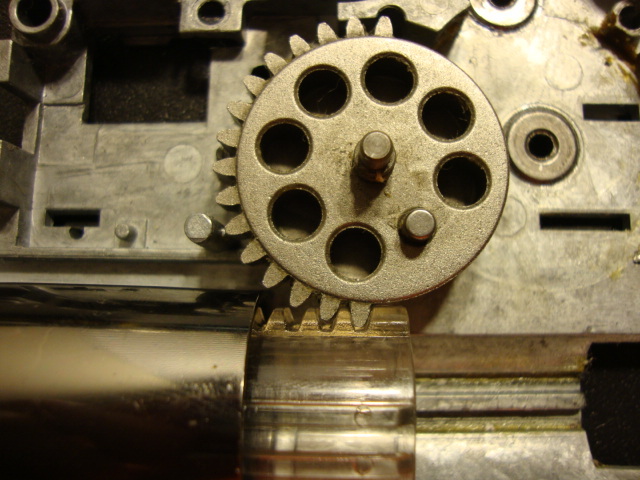 You want the teeth of the sector gear to hit the 1st tooth of the piston first, and then, as they pull the piston back, grab onto the other teeth of the piston. Now, you're almost done. 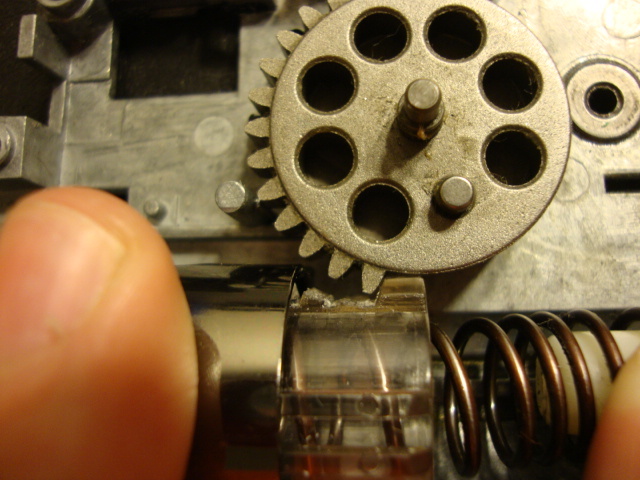 There's one last thing that needs to be done: You need to check the AoE with the spring in the gearbox. The reason we do this, is because sorbo absorbs shock, it's a foam, and it collapses under pressure. 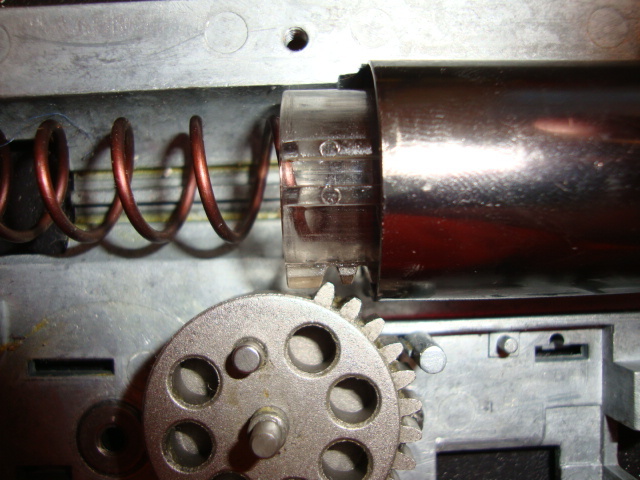 When the spring is installed into the gearbox, it puts the sorbo under pressure, and it collapses a little bit, changing the AoE ever so slightly. 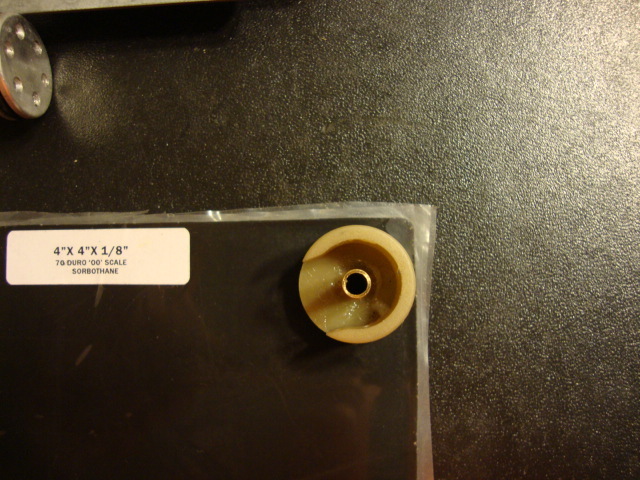 See, now I've got the spring in there, and it's pressed the sorbo pad in ever so slightly. I'll need to put an extra washer behind the piston head to recorrect the AoE. And that's how you correct the AoE of a gearbox. 1st. There are many, MANY ways to correct your AoE. 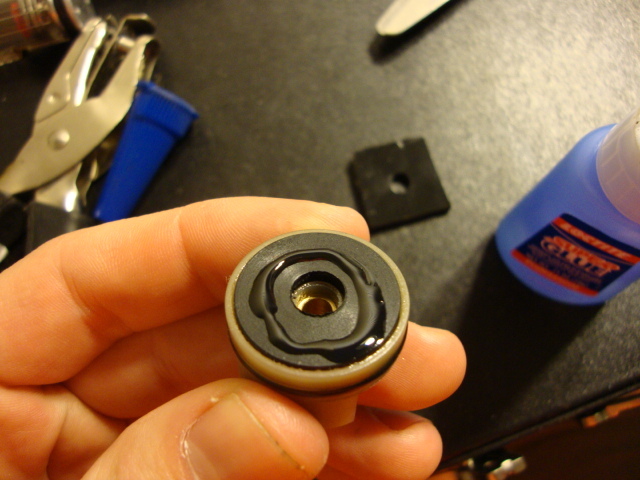 I've seen people use their own foam pads they had lying around; some just use washers behind the piston head. People use a variety of materials. Look around, see what you have. As long as they AoE is correct with the spring in the gun, you should be ok. Obviously, there are some materials that are weaker than others. Softer materials will degrade faster, sometimes they'll compress too much, and hardly work at all. 2nd. I suggest using sorbo from Sorbopads.com. They will cut down on the time you spend cutting, shaping, and punching holes in sorbo pads themselves. You can also order them in different widths, sizes, and for different guns. All you have to do is glue them in and be done with it. 3rd. You've seen me mention McMaster Carr a few times. If you want to get some sorbo yourself, and if you want to get the washers that I use, this is where I get them. 8514K51 is the number for the Sorbo pad that you see in this picture, 95606A180 is the number for the washers that I use.